Relief may be on the way in the form of a bill introduced this past Thursday sponsored by City Councilmembers Carlos Menchaca (Red Hook), Margaret Chin (Lower Manhattan, Governor’s Island) and Helen Rosenthal (Upper West Side). The bill seeks to ban sightseeing helicopters that do not comply a specific range of noise levels as determined by the Federal Airport Noise and Capacity Act of 1990. It does not include helicopters utilized by the military, media, emergency services (fire, police, coast guard, etc) private or chartered helicopters. 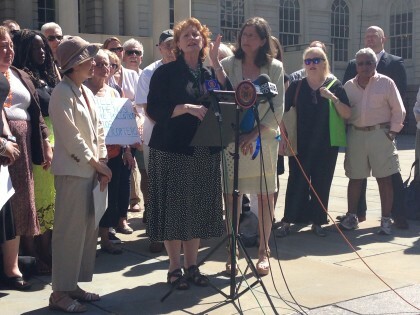 Supporters from Stop the Chop NY NJ flank Councilmembers Margaret Chin and Helen Rosenthal on the Steps of City Hall. At a press conference held on the steps of City Hall, elected officials representing Manhattan, Brooklyn, Queens and Staten Island along with grass roots activists and fed-up residents from the Upper West Side to Downtown Brooklyn alike decried the scourge of noise and environmental pollution they attribute to helicopter tourism. Councilmember Helen Rosenthal began, “We are here to stop the noise that is completely ruining the lives of so many New Yorkers…We look forward to working with the de Blasio administration to pass this legislation.” Councilmember Chin pleaded, “stop these helicopters that are disrupting the quality of life!” Chin added, “we welcome tourists to NYC…if they want a beautiful view they can go up to the [observation deck of] World Trade Center,” drawing chants of “Stop the Chop!” from rally attendees. Assemblymember Jo Anne Simon addressing the press. Yes, “a step in the right direction”. A very welcome step. Even though the large number of non-tour helicopters would remain flying, I’m hopeful that this bill could make a significant reduction in noise levels. Of course the tourist helicopter industry would be allowed to continue with the current number of flights if they made changes to lower the noise. I don’t have any idea if the existing helicopters could be retrofitted to achieve these standards, or if the industry is profitable enough that they’d sell the existing helicopters and buy new quieter ones. But either way, it would have to be an improvement over the current bedlam! I live across the street from the Promenade. I never hear the copter noise. I like the assignment that copters think our neighborhood is worth seeing. I’d rather the copters than Uber. You must be deaf or you have those sound proof windows and don’t leave your apartment during daylight hours. I’m sorry, could you repeat that? The copters are so loud I couldn’t hear what you said. This is a fantastic development. 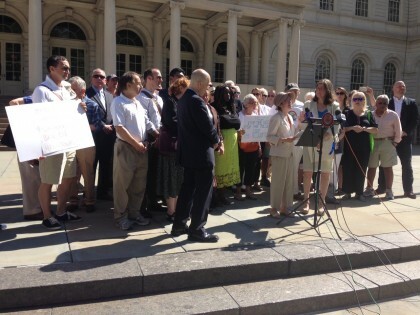 a- why Councilman Levin didn’t co-sponsor the bill? He seems to be in support. b- what the likelihood is that this legislation will pass the Council and that the Mayor will sign it? 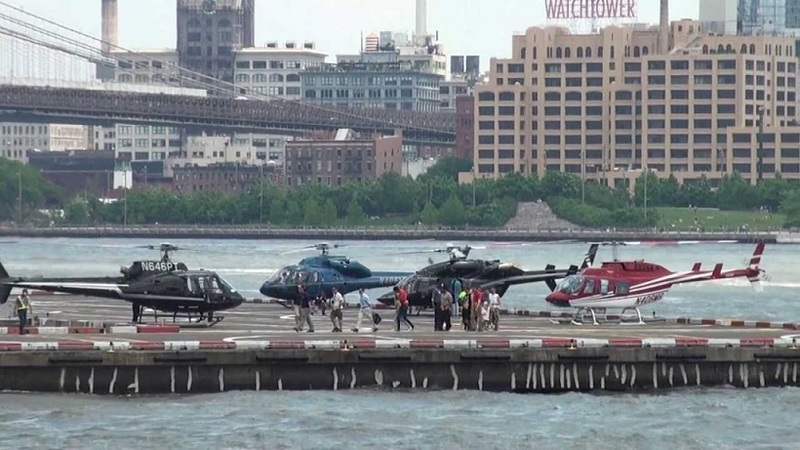 Bottom line is we don’t need to disturb, noise pollute, and endanger tens of thousands of NYC residents daily with endless tourist helicopters flying overhead, merely to provide dozens of tourists with joy rides. These tour copters are in addition to the numerous police, other gov’t agencies, news media, commuter (e.g., to the Hamptons, the airports), etc., aircraft already flying all around. Tourists can view the city via the Circle Line, Empire State Bldg and WTC observation decks, sightseeing buses, taxis, etc. Thanks for the recap! And please support us at http://www.stopthechopnynj.com! As I Hoboken resident I too am wholeheartedly hoping that this legislation goes through! The effects of these tours on Hudson Jersey side is disastrous! Constant thrush and rumble all day. Waterfront enjoyment is totally diminished and you can hear them throughout town, indoors or out! Last Tuesday, my husband and I were on our approach at LGA and the plane suddenly and dramatically pulled up. I had my window shade down, but the passengers behind us said they saw red helicopter blades pass just under the wing. This was confirmed by the pilot, who said, yes and “they were not supposed to be flying in that airspace”. Very scary. Not only is the noise unbearable, but it is incredibly unsafe. I too am in full support of the ban the tourist helicopters they have ruined all our waterronty parks. Brooklyn bridge park is completely ruined from helicopter noise all day every day, as is govenors island as is hudson river park.